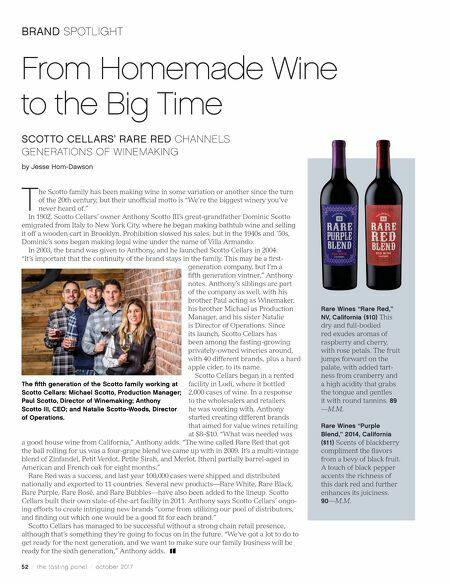 52 / the tasting panel / october 2017 BRAND SPOTLIGHT T he Scotto family has been making wine in some variation or another since the turn of the 20th century, but their unofficial motto is "We're the biggest winery you've never heard of." In 1902, Scotto Cellars' owner Anthony Scotto III's great-grandfather Dominic Scotto emigrated from Italy to New York City, where he began making bathtub wine and selling it off a wooden cart in Brooklyn. Prohibition slowed his sales, but in the 1940s and '50s, Dominic's sons began making legal wine under the name of Villa Armando. In 2003, the brand was given to Anthony, and he launched Scotto Cellars in 2004. "It's important that the continuity of the brand stays in the family. This may be a first- generation company, but I'm a fifth generation vintner," Anthony notes. Anthony's siblings are part of the company as well, with his brother Paul acting as Winemaker, his brother Michael as Production Manager, and his sister Natalie is Director of Operations. Since its launch, Scotto Cellars has been among the fasting-growing privately-owned wineries around, with 40 different brands, plus a hard apple cider, to its name. Scotto Cellars began in a rented facility in Lodi, where it bottled 2,000 cases of wine. In a response to the wholesalers and retailers he was working with, Anthony started creating different brands that aimed for value wines retailing at $8–$10. "What was needed was a good house wine from California," Anthony adds. "The wine called Rare Red that got the ball rolling for us was a four-grape blend we came up with in 2009. It's a multi-vintage blend of Zinfandel, Petit Verdot, Petite Sirah, and Merlot, [then] partially barrel-aged in American and French oak for eight months." Rare Red was a success, and last year 100,000 cases were shipped and distributed nationally and exported to 11 countries. Several new products—Rare White, Rare Black, Rare Purple, Rare Rosé, and Rare Bubbles—have also been added to the lineup. Scotto Cellars built their own state-of-the-art facility in 2011. 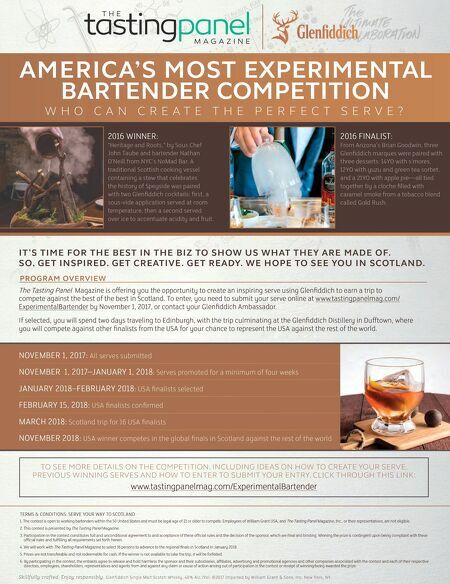 Anthony says Scotto Cellars' ongo- ing efforts to create intriguing new brands "come from utilizing our pool of distributors, and finding out which one would be a good fit for each brand." Scotto Cellars has managed to be successful without a strong chain retail presence, although that's something they're going to focus on in the future. "We've got a lot to do to get ready for the next generation, and we want to make sure our family business will be ready for the sixth generation," Anthony adds. From Homemade Wine to the Big Time SCOTTO CELLARS' RARE RED CHANNELS GENERATIONS OF WINEMAKING by Jesse Hom-Dawson Rare Wines "Rare Red," NV, California ($10) This dry and full-bodied red exudes aromas of raspberry and cherry, with rose petals. The fruit jumps forward on the palate, with added tart- ness from cranberry and a high acidity that grabs the tongue and gentles it with round tannins. 89 —M.M. Rare Wines "Purple Blend," 2014, California ($11) Scents of blackberry compliment the flavors from a bevy of black fruit. A touch of black pepper accents the richness of this dark red and further enhances its juiciness. 90—M.M. The fifth generation of the Scotto family working at Scotto Cellars: Michael Scotto, Production Manager; Paul Scotto, Director of Winemaking; Anthony Scotto III, CEO; and Natalie Scotto-Woods, Director of Operations.